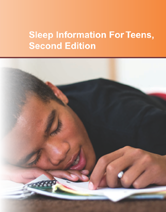 Sleep Information For Teens, provides facts about sleep and sleep requirements for teens. It explains the biological processes involved in sleep and discusses circadian rhythms, dreaming, sleep hygiene, and sleep disorders, including insomnia, delayed sleep phase syndrome, sleep apnea, narcolepsy, restless legs syndrome, sleep walking, and enuresis (bedwetting). Chapter 8–How Much Sleep Do You Need? Chapter 47–Does Sleep Deprivation Lead To Weight Gain?